Part of a busy Edinburgh road was closed after a piece of masonry fell onto a pedestrian. A section of Princes Street, near one of the main access points to the city's festive celebrations, was shut after the incident at 10:50. 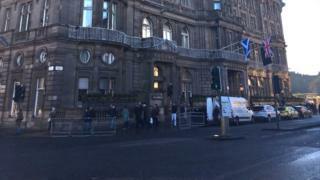 The man in his 40s was hit on the head by masonry which fell from the Balmoral Hotel. He was injured but not believed to be in a life-threatening condition. He was taken to the Edinburgh Royal Infirmary for treatment. It is understood a workman was abseiling down the hotel when his foot accidentally hit a piece of the building which caused it to break off and drop onto the street below. Pedestrians and traffic were blocked off in both directions between North Bridge and St Andrews Square as a precaution. Police Scotland reported the incident to the Health and Safety Executive and City of Edinburgh Council. Safety inspectors were checking the site. A spokesman for The Balmoral said: "A piece of spalling fell from the hotel while external contractors were conducting a safety masonry check of the building. "All work was immediately stopped and we worked closely with Police Scotland and City of Edinburgh Council to ensure that additional precautionary public safety measures were put in place. "Following the incident the exterior of the building was checked and confirmed safe. "The safety and wellbeing of the gentleman involved and the general public is of the highest priority. "A full investigation will now be carried out with our external contractors."